It has been a while now since we have completed the sand trap renovation on hole 8 but I only just now have the time to write about it. Last winter we again saw a huge volume of groundwater coming out from beneath the wall behind 8 green. The groundwater around 8 green has been crazy the past few years. Incredibly high volumes of water have been popping up here and there as fast as we can install drainage pipe. Anyways the water that was coming out from the wall was flowing out onto the green and into the large sand trap on the right of the green. We have since installed a catch basin behind the green to prevent any surface run-off from flowing onto the green. Either way the way the trap was designed cause all the sand to wash down to the front and into the rough. The quality of the sand was also at a point where we were looking at a total sand replacement in this trap. This trap has also been a safety hazard for the maintenance staff for years. It was built only 2 feet from the edge of the green making it very difficult to turn our mowers without going into the trap. It was also very difficult to maintain. The slope of the trap caused all the sand to pile in the bottom and we were forced to shovel the sand back up the slope weekly! So I asked myself "Do I really want to spend all this effort to fix up this hard to maintain and dangerous trap?" In case you're wondering....no...no I didn't! Fill has been added and the traps are starting to take shape! I came up with a plan to move the traps further from the green to increase the room for turning equipment as well as level out the bottom of the trap. I also decided that 2 traps would be better than 1 big trap. It would make it easier to mow, reduce the amount of weed whacking and still catch errant shots before they went over the steep embankment. In April we were working on a few subsurface drainage projects so I used the waste material from the ditches for fill on this project. We also used some of the left over fill from the previous irrigation system upgrades that were done 2 years ago. A view looking towards the tees from the back of the traps. We decided to not line the traps as all of our existing traps aren't lined and I wanted to keep things consistent. I have found that liners often cause more problems than they solve and we have very little issues with our liner-less traps. I also decided not to install subsurface drainage in these traps as the ground here was very porous and already drained remarkable well. So far to date we have had absolutely no puddling in these traps. Once the traps were roughly shaped we sodded the ground so that we could bring this area into play as soon as possible. As we had used up most of our good sod I was forced to use a less than ideal area from our nursery. The sod we used was full of clover and weeds and I wasn't sure how it would turn out. I used it anyway just to cover the ground to hold the soil together for the time being. 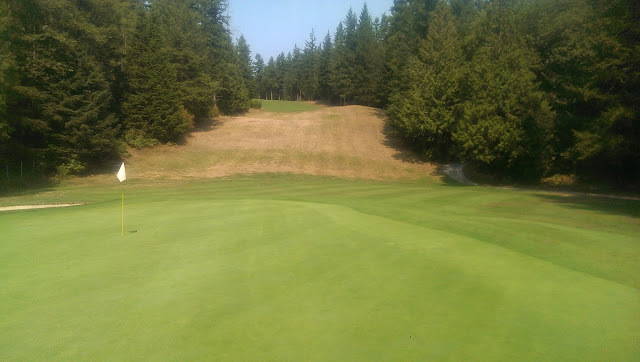 It turns out that after a season of good maintenance almost all of the clover and weeds have been choked out from the turf and as always we don't use any herbicides at Pender Harbour! We had to purchase new sand for the traps as the old sand was completely contaminated with rock and debris. We used the sand from the CAL gravel pit as it is the same sand that we use in all our other traps and I wanted to keep them looking and playing consistent. The only trouble with this sand is that the spec has changed at the pit, and now it is full of the odd 3/4" rock! We remove any rocks that we can find every time we rake it! It really is too bad that even though we have the largest gravel and sand pit in North America, they can't seem to accommodate the golf courses! We lined the trap edges with 4" strips of plywood to keep the edges intact and allow the sod to really knit in and stabilize. I had a number of complaints over the season mostly from the visual impact and also from the fact that it might damage a club if it was struck. For this reason I placed the traps as GUR. I really wanted to start the edges off right to prevent future troubles. We recently removed the bunker boards and gave the traps a finishing edge. I think you will agree with me when I say that they look fantastic! The crew has really enjoyed the increased area for turning and overall feel safer on this green. The traps also save us a lot of time each week in maintenance. The sod has knitted great, looks good and healthy and I also think that the overall appearance of the area has improved. The only real cost for this project was a portion of a load of sand and a sheet of plywood. Everything else was done with recycled materials on site. I hope that this improvement will reduce maintenance cost and increase the safety of this area of the course. This is just another thing that we have done to try and increase the sustainability of our club! Thank you everyone for your patience while we worked on this project.